How Much Is a stanley tools warranty worth ? How good is a Stanley Tool Warranty? How good is Amazon's Customer Service? Not so Good in this commentator's experience. 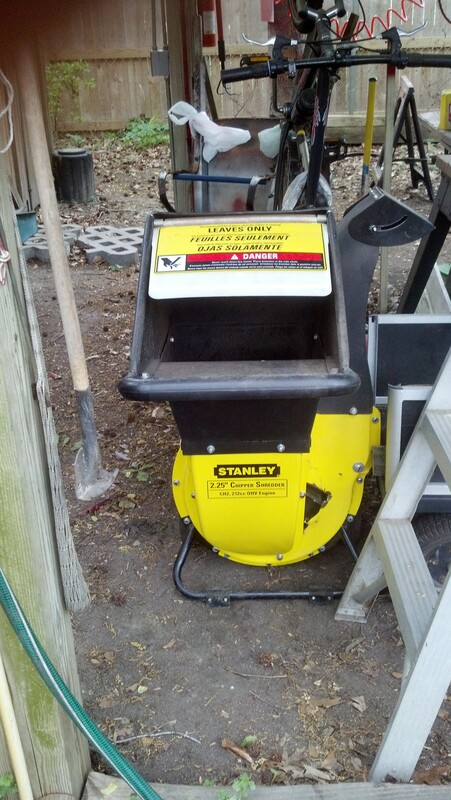 Back in early March, 2016 I was mulching magnolia leaves [green] in this Stanley product, when there was a series of loud noises followed by shrapnel blowing out of a hole this Stanley Chipper/Shredder make in its back the side via cast iron rotor and hammer blades . 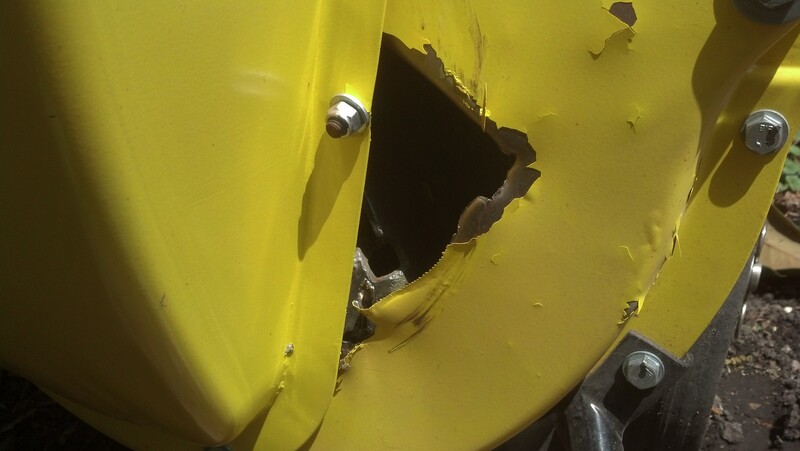 Fortunately at the time I was wearing chain saw chaps that prevented the many pieces of shrapnel from both the casing and cast iron pieces from causing major injuries other than a few bruises. From here things got worse. I called the number [1-800-393-0688] listed of the face of the owner's manual. After responding to a number of prompts from the auto answering service I was switched to a woman who identified herself as D'Ashley. I told her what had happened and that I wanted to get a new machine under the warranty. She requested and I gave her my contact information. She then told me that she needed to talk with her supervisor and get back to me. Close to a month passed and I heard nothing from D'Ashley. Noon the next day [Friday] came and went. The next day I called only to find out that Sanders was off and would not be in until Monday. I called Monday I called again and ended up with Sanders again. She was still waiting to hear from her boss. Now going on four months numerous emails, phone calls, delivering the machine to the service center, which recommended that the machine be replaced and the warranty is not being honored. Thank you for reaching out to us. I am very sorry to hear that this issue with your unit has not been resolved. I have sent your contact information over to our team that handles this unit directly. They will be contacting you shortly. If you would like to contact them in the mean time you can do so by calling 800.393.0668. We appreciate your patience and look forward to getting this resolved. In case this email does not fully answer your question, or you would like to contact us for any reason, simply reply to this email. Last week I told you about health insurer Anthem’s data breach affecting more than 80 million customers. This week, I’m telling you about scam artists who are sending phony “Anthem” emails that pretend to help customers, but actually phish for their personal information. So, if you get an email that says it’s from Anthem offering you services in response to the data breach, don’t reply, click on any links, or open any attachments. Instead, forward it to the Federal Trade Commission atspam@uce.gov, and delete the message from your inbox. To learn more, read our article on how to deal with phishing scams. Are you a Jerk or being screwed? Have you been designated as a Jerk? Blackmail via harvesting personal information from Facebook ? The operators of the website Jerk.com were sued by the Federal Trade Commission today for harvesting personal information from Facebook to designate more than 73 million people jerks or nonjerks, then falsely claiming that consumers could revise their online profiles by paying $30. According to the FTC’s administrative complaint, Hingham, Mass.-based Jerk.com and manager John Fanning from 2009 to 2013 operated the social-networking site where users could create profiles of other people using the "Post a Jerk" feature. "Although Jerk, LLC, claims that its website contained only user-generated content, respondents actually created or caused to be created the vast majority of Jerk profiles using information from Facebook," according to the FTC complaint. "Respondents earned revenue by selling ‘memberships’ for $30, by charging consumers a $25 customer service fee to contact the website and by placing third-party advertisements on Jerk." The site featured user profiles with buttons underneath, where people could vote on whether the person was a jerk or nonjerk. The profiles also contained comment fields, where people wrote things like "Omg I hate this kid he’s such a loser." According to the FTC, an estimated 24.5 to 33.5 million profiles contained a large photo of the person, and about 2.7 to 6.8 million Jerk profiles contained a photo of a child who appeared to be under age 10. In a March 2013 petition to quash the FTC’s civil investigative demand, Jerk.com attorney Maria Crimi Speth, a partner at Jaburg Wilk, in Phoenix, wrote that children under 14 are prohibited from using the site, and that if a child’s profile is brought to the company’s attention, it is removed. In the petition, Speth said that "in 2012, Jerk.com only had 22 people subscribe to its service and its total revenue was approximately $3,000." In the same petition, she also said that the site has almost 100,000 visitors per day. "The content in profiles often displays information that is publicly available in a Google Internet search as well as newly created user-generated content," she wrote. She did not respond to a request for comment. The FTC disputed that the information in the profiles was public. "Numerous consumers have complained that photographs and other information about them on Jerk were originally posted on Facebook using controls that enabled users to designate material for dissemination only to a limited group, and that the information was not designated for public viewing," the complaint states. The FTC said Jerk got the data through Facebook’s application programming interfaces. Developers who use the interfaces are supposed to abide by Facebook’s policies, including obtaining consumer consent to use data and deleting information obtained from Facebook upon a consumer’s request. Jerk on its website previously said that "No one is ever removed because Jerk is based on searching free open Internet, searching databases and it’s not possible to remove things from the Internet. You can however use Jerk to manage your reputation and resolve disputes with people who you are in conflict with." According to the FTC, "Numerous consumers believed that purchasing a Jerk membership would permit them to alter or delete their Jerk profile and dispute false information on their profile. In numerous instances, consumers who paid for a standard membership received nothing from respondents in exchange for their payment of the membership fee." Also, it cost $25 to email Jerk’s customer service department. The FTC sued Jerk under the Section 5 of the FTC Act, alleging the company made false or misleading representations and that its conduct was deceptive. The FTC is seeking an order prohibiting the defendants from using improperly obtained personal information and requiring them to delete the information. The FTC also said it "may be necessary and appropriate" to seek consumer redress. An evidentiary hearing before an administrative law judge at the FTC is set for Jan. 27, 2015.The FTC said Jerk got the data through Facebook’s application programming interfaces. Developers who use the interfaces are supposed to abide by Facebook’s policies, including obtaining consumer consent to use data and deleting information obtained from Facebook upon a consumer’s request. An evidentiary hearing before an administrative law judge at the FTC is set for Jan. 27, 2015. Forget the turkey — are you craving some Cyber Monday deals? A little research can help you get the best deal and avoid hassles. Here are some tips to help you save some money and protect your financial information. Read reviews. Type the name of the product or company into a search engine along with words like “review,” “complaint,” or “scam.” Be sure to read a few reviews — don’t rely on just one source. Know the terms. Find out what the refund/exchange policies are, and if there are any charges (like shipping costs or restocking fees) if you return a product. Pay by credit card. Credit cards give you protections that other methods of payment may not. If there’s a problem, you have the right to dispute charges and temporarily withhold payment while your dispute is investigated. Use secure checkout. Before you enter your credit card information online, check that the website address starts with “https”. The “s” stands for secure. If you don’t see the “s,” don’t enter your information. This is the second Cuisinart within a year that has had to be replaced. Postage to scrap the would have been a lot less if the unit could have seen sent to Cuisinart's New Jersey facility , but because it was a replacement it had to go to Arizonia to be scraped. It seems they do what ever they can to keep you from using their expensive warranty. 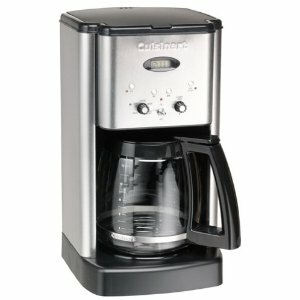 The issue in both cases was that the unit stopped brewing in mid-cycle and the coffee was not very hot. ·How can I protect my investments from inflation? ·How do you know you're really ready to retire early? ·How can I get downside risk protection with robo-advisors?